You may have probably heard of Stradivari, and maybe seen his million-dollar Stradivarius violin in museums. But have you ever wondered why Stradivari was able to make such beautiful and famous violins that almost all violinists in the world want to piece of it? You will find the answer to the secrets of the Stradivarius violin. Antonio Stradivari (commonly known as Stradivari), is one of the world’s famous violin maker in history. He was born in 1644 in Cremona, Italy (same birth place as Amati). He is believed to pick up his Stradivarius violin making skills under Nicolo Amati in the 1660s, the grandson of the the first violin maker in the world, Andrea Amati. Guarneri was also one of Amati’s disciples, who later become one of Stradivari’s rivals in making world’s best violins. He made his first ever violin in 1666, under the tutelage of Nicolo, when he was 22. While learning Nicolo’s traditional Amati violin making techniques, Stradivari improved the techniques and created his personal unique style for making his Stradivarius violins. Stradivarius committed almost 70 years of his life to making and perfecting his violins. He has made over 1000 string instruments throughout his life, while only about 650 still exists today. It is believed that he made his well-known violins in his attic, where he tested and experimented with the tone and design of his Stradivarius violins. 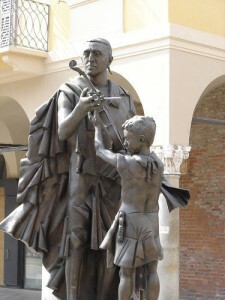 A statue of Stradivari passing down his exceptional violin skills to future generations. He continued his works on making and refining Stradivarius violins and other stringed instruments, but the number of works decreased over the years. He carved his last piece of instrument at age 93, when he died. His 2 sons, Francesco and Omobono joined their father’s trade in Stradivarius violin making, but none have reached and achieved their father’s first class standard. Violins made by Stradivari are commonly known as Stradivarius, or the Strad. Till today, they are considered one of the finest violins in the world, after over 300 years since its creation. Most of the Stradivarius violins exists today are played by distinguished violinists, owned by collectors, or housed in museums. Some of the most priced Stradivarius violins were made during Stradivari’s ‘golden years‘ from 1700 to 1725. Within these years, he perfected the violins, and define the new standards of violin models for future violin makers. One of Stradivari’s famous work, the Messiah. The two famous Strad made during his golden years – Lipinski (1715) and the Messiah (1716). Stradivari’s unique creation of the Stradivarius violin have led to many modern violin makers creating replicas of the original Strad, in hope of matching the original Stradivarius violin’s design and powerful tone. Stradivarius violins are worth from hundred of thousands to millions of dollars today. Many Strads are auctioned and sold at world-record prices. Stradivarius Violin In The News! Most recently in 2010 and 2011, two Stradivarius violins hit the news headlines for auctioning at world record prices. The “Monlitor” Stradivarius violin – Rumoured to be owned by Napoleon Bonaparte, was purchased by Austin-based violinist Anne Akiko Meyers on October 2010, for a record value of US$3.6 million. The Strad was sold online by Tarisio Auctions. More info here. The “Lady Blunt” Stradivarius violin – was auctioned in June 2011 for a record price of US$16 million. This is almost 4 times the amount paid for the previous world-record price. This 1721 Strad was sold by Nippon Music Foundation in an online London auction hosted by Tarisio, with all proceeds to aid Japan’s relief efforts from March 11 tsunami and earthquake. More info here. Hi Steve, nice to hear from you. It’s wonderful that you had an old violin from your Fathers. From the label, we can see that it’s likely to be manufactured in 1911, based on a Stradivari model. I would say its most likely to be a Stradivari replica violin. Though it might not be an original Strad made by Stradivari himself, I could say it can still possess significant value with its long age and model. Likewise, you can check it with a luthier too. It’s probably impossible to determine the provenance of any violin without seeing it and examining it. So, to call a violin a copy without actually looking at it, is not valid. It very well may be a copy, but it needs to be seen. I had one and wanted to know if anyone would sale their et root violin and if so please contact me with price. The Lady Blunt violin is considered to have fetched a much higher price than would normally be the case because it was being auctioned in aid of the Japanese tsunami and earthquake relief. As far as I am aware it is still the world record but is regarded as exceptional for the reason given. Hi Nick, I agreed with you too. The world record price the Lady Blunt fetch is a much higher than thee previous record holder. It is also truly exceptional for the owner of Lady Blunt to auction it for a greater cause. I have a violin that was handed down from my father before he died. It says on the inside Antonius Stradivaris, Cremonensis, Faciebad anno 1765 with a circle with cross and A.S. on the inside and made in Czech. Could you tell me if it is worth anything and how much. Czech (Bohemia) violins do not have much value, unfortunately, and I know no one wants to hear that. But genuine Stradivari violins are mostly accounted for. They became collectors items way back when they were made. Count Cozio was one of the original collectors of violins, especially Stradivari’s. He even collected labels and is even responsible for tampering with labels. I inherited a Stradivaris. It belonged to my Great Grandfather who passed away 1926. Where the pegs are there is a tuner like a guitar. The neck was bowed. I’d like to know about this violin. You need to at least submit photos, good quality photos, before any determination can be made, and even then only an expert objective appraiser will be able to tell whether it is authentic. There are many features on a Stradivari that tell the story and not necessarily the label. Tampering, removing and replacing labels in instruments is a history that probably pre-dates Stradivari. And as I said before, Stradivari was probably the most copied violin maker. He was famous and rich in his own lifetime, and violin making is and was not very lucrative, so the incentive to sell a copy as an original was fairly widespread. Most Strads are accounted for. Stradivari died in 1737 and his sons died a few years later, so the date you mention does not correlate. I have an old violin 595mm long in good condition ! I have taken a number of photographs which can be sent if I have an appropriate e-mail to which I can forward these images. This violin has been in our family for at least 100 years or more ! Keep in mind that Stradivari was the most copied violin maker, and why not, as he set the standard. 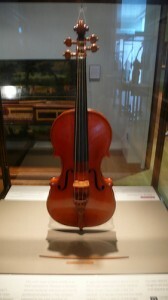 The French made very good copies, Nicholas Lupot was called the French Stradivari and then you have Jean Baptiste Vuillaume who not only produced some of the finest bows (made by great bow makers but sold under Vuillaume’s brand), but also produced some of the greatest copies of Stradivari and Guarneri. In fact some believe that the “Messiah” Stradivari was made by Vuillaume because of it’s pristine condition. Most violins will have Stradivari-like features or perhaps Guarneri style, it takes knowledge and thorough examination to make a final determination on the authenticity of any violin. original case, strings, 2 bows, bridge, rosin etc..
Do you know a value??? Hi we have a Root Duerer Violin on the back of the neck says R.D., it was made for and sold only by E.T.Root & Sons. Chicago, U.S.A. also says Switzerland Anno Dom 1910 No. 1440 was wondering if anyone might know what its worth? I have just inherited a violin that’s been passed down many generations and in the inside it has the label for a 1728 Stradivari. The 28 is hand written on an old label which as faded into the wood. I have taken pictures of it. The case that it is in is very old as well. I would like to know what I have. Ann, forget the case, as it has no bearing on the violin. You need to take your violin to someone you trust and who is knowledgeable and reputable to determine what you have. According to the most respected experts in the field, of the remaining Stradivari’s in the world (except for mine) are all accounted for and the last newly discovered Stradivari was around 1960 in Italy. That doesn’t mean it is not impossible, but highly improbable, the odds similar to winning the lottery. I personally believe that experts are reluctant to put their name on a certificate for that reason, unless other documentation attests to the authenticity. My own theory as to why the sons (of Stradivari) never reached the level of the master is because biographers of Stradivari relegated the sons to more menial tasks such as setting up the finished product. Another reason is that Stradivari was strict about the sons using their own labels, since in my opinion, Stradivari ran a business and it was his label that drew attention and commanded the price. But, the most current research claims that the sons had a large part in the construction of many of their father’s best works. They were trained by him, and those few violins that exist, maybe 20 worldwide, are considered masterpieces. The labels they used “Sotto la Disciplina” were mostly removed when the number of violins remaining in the shop were sold after the father’s death and replaced with the more orthodox labels. So to say that the son’s work was inferior, is totally false. See: Roger Hargrave, “Undercover Agents in the STRAD magazine.